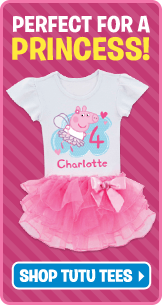 Our Peppa Pig Shop honors the fun-loving and silly swine along with her many friends and family. The lovable Brittish children's show can be seen on Nick Jr. and follows the animated and educational adventures of Peppa! Here you can find toys, books, and DVDs featuring everyone's favorite pig! This Peppa Pig Shop is also home to personalized Peppa Pig clothing, school supplies and even room decor.